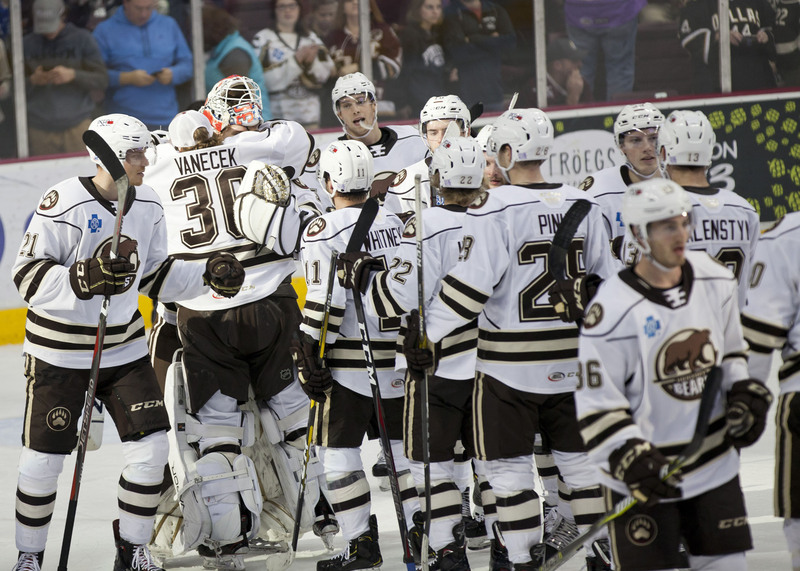 The Hershey Bears beat the Providence Bruins 2-1 Sunday evening at Giant Center in Hershey. The win improves the Bears record to 14-18-0-2 on the season. The Bears are back in action on Saturday for the first game of 2019 when they host the Grand Rapid Griffins at Giant Center. Puck drop is set for 7:00 PM. Beck Malnestyn would start the scoring with a nice theft and finish to give the Bears a 1-0 lead at the first intermission. The Bruins would tie the game midway through the middle frame, but the Bears would answer with a goal from Steve Whitney to give the Bears a 2-1 lead at the second intermission. The final frame would go without a score. Scratches: Lucas Johansen (upper body), Connor Hobbs (upper body), Shane Gersich (upper body), Kris Bindulis (upper body), Grant Besse (upper body) were the injury scratches. Max Kammerer, Kevin McKernan, John MacLeod and Tobias Geisser (World Juniors) were the healthy scratches. The Bears opened the scoring with a goal from Beck Malenstyn at 5:06 of the opening frame. Brian Pinho (3) was credited with the lone assist. The goal was Malenstyn’s third of the season and first in 13 games. The first period ended with the Bears leading 1-0. The Bruins outshot the Bears 6-5 for the first 20 minutes. The Bears were 0 for 1 and the Bruins 0 for 2 on the man advantage. The Bruins would tie the game midway through the middle frame with a goal from Karson Kuhlman at 11:16 of the second period. The goal was the result of a turnover by Riley Barber behind the Hershey goal. But the Bears would quickly respond. Steve Whitney would score on the end of a beautiful breakaway play at 12:38 of the middle frame, making it 2-1. Aaron Ness (17) and Jayson Megna (8) were credited with the assists. The second period would conclude with the Bears leading 2-1. The Bears outshot the Bruins 8-7 in the middle frame, with SOG 13-13 after 40 minutes of play. Both teams were 0 for 2 on the man advantage after 40 minutes of play. The Bears would clamp down in the final frame, as the third period would go scoreless. Beck Malenstyn was the first star, Steve Whitney, second star and Ilya Samsonov was the third star of the game. Ilya Samsonov stopped 22 of 23 shots faced. Ryan Sproul, Liam’Brien and Riley Barber led the Bears in shots with 3. The Bruins were 0 for 3 and the Bears 0 for 2 on the power play. This entry was posted in News and tagged Beck Malenstyn, Hershey Bears, Jon Sorensen, Providence Bruins, Steven Whitney. Bookmark the permalink.